A steeply sloping site, minimal access and a large water tank in the middle of the yard proved to be no problem for Josh of Enigma Outdoors. 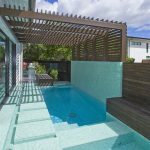 When the owners of this property in Camp Hill, Brisbane approached him to transform their back yard from construction site to elegant courtyard, he was excited about the possibilities and potential. 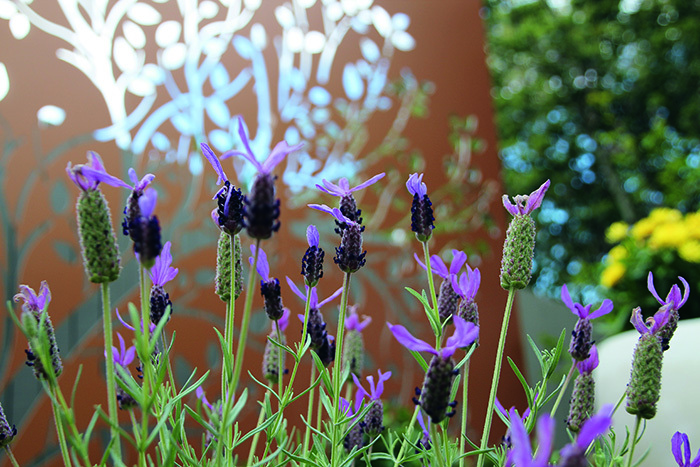 There were four main components to the brief: the clients needed space to entertain guests in the garden, they wished to disguise views of the neighbourhood beyond their fence, their water tank had to be hidden and the style of the garden needed to have a Mediterranean influence with a modern twist. 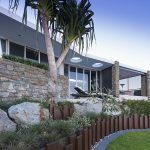 “With their brand new home under construction, our clients realised that access was going to be a problem and arranged for us to start the hard landscaping early in the building phase. Even at that point, we had to use specialised, narrow access machinery and equipment to efficiently navigate the small site” said Josh. The slope of the property was turned from negative to positive by carefully positioned terraces which cleverly divide the site into two distinct living spaces. The path, paved in Silver Travertine leads to a raised dining area where balmy Queensland nights can be enjoyed by candlelight. Here the existing side boundary has been obscured with screens and plantings of evergreen magnolias, which will provide a verdant background to the dining table as time goes by. The rendered wall and steps used to create this raised area are both capped with silvered travertine, marrying a practical necessity with luxurious materials. “Enigma Outdoors and our complementary pool construction company, Porpoise Pools, have access to the best stone merchants in the industry,” said Josh, “guaranteeing our clients receive the highest quality products available”. Moving to the bottom of the garden brings the owners and guests to the second living space where they are free to simply sit and relax. The lush perimeter plantings of species such as Michelia Figo will perfume the air and create the illusion of solitude once they reach maturity, without obstructing too much of the beautiful, Queensland sun. “Dealing with the water tank is where we had to get really clever,” said Josh. It’s under the removable deck, concealed from view, but easily accessible when necessary. In a way, it’s typical of this project – something which could be viewed as a problem has been turned around to become an asset to the design, a positive element to the project. 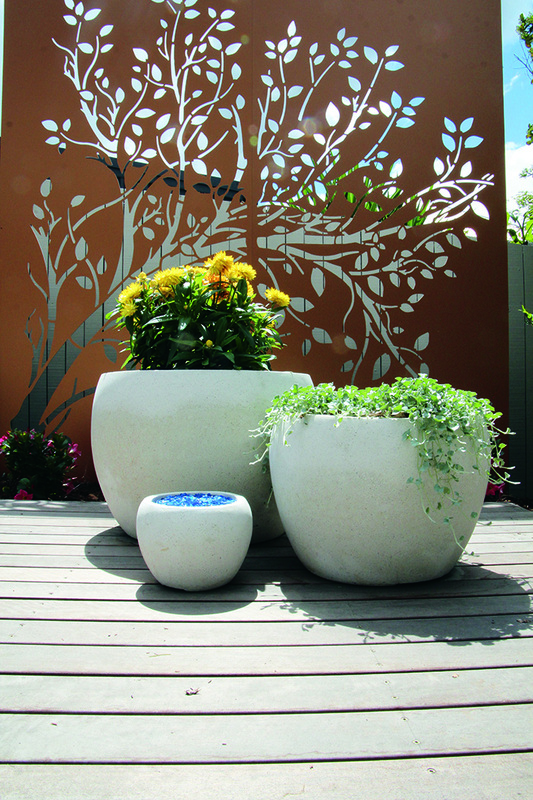 Deliberately placed urns and pots achieve a useful compromise between spatial issues and creating splashes of colour and drama. Josh has chosen a low shallow urn for the upper terrace, which he planted with a magenta bougainvillaea for a spectacular splash of colour. Pots on the deck in the lower garden combine traditional Dichondra ‘Silver Falls’ contrasted with vibrant Bracteantha ‘Strawburst’ and blue, crushed glass. To the rear of the deck sits the striking copper-toned, aluminium composite screen, supplied by Sanctum Screens. 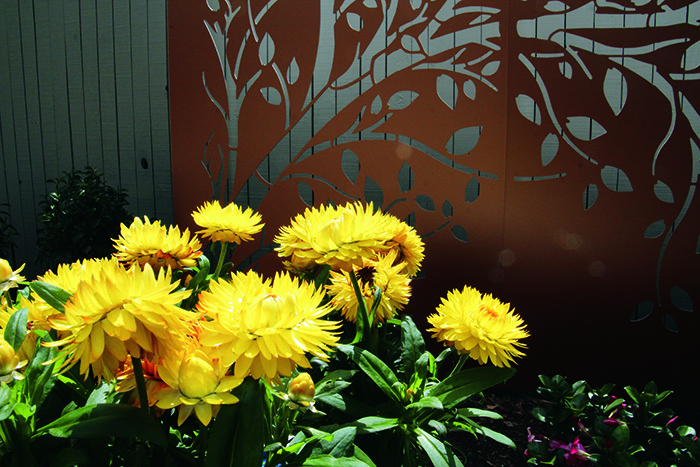 This screen is the focal point of the garden, drawing the eye to the beauty of the custom, windswept tree design instead of the adjoining property and shed. 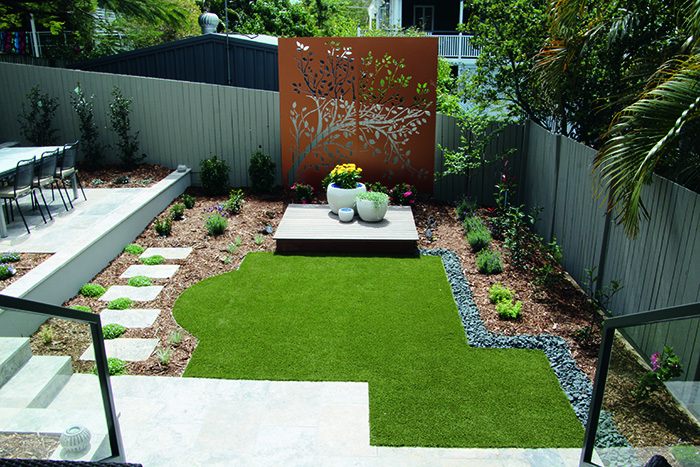 Enigma Outdoors is a Brisbane based business that has been creating quality projects for the past decade. 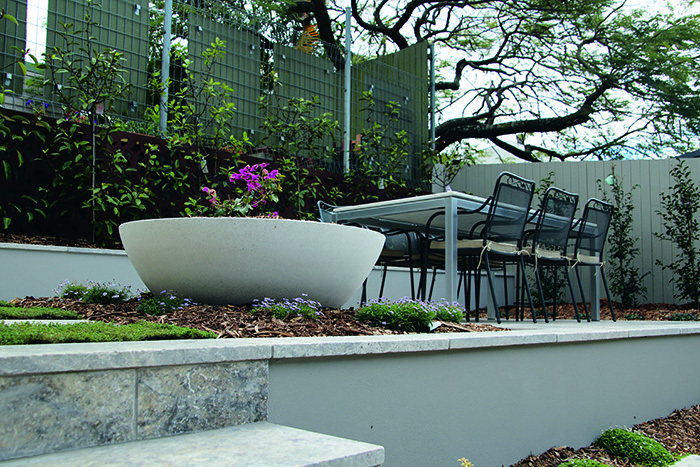 The business is part of the Enigma Outdoors Group, which offers comprehensive landscape design, landscape construction and concrete swimming pool construction (Porpoise Pools). 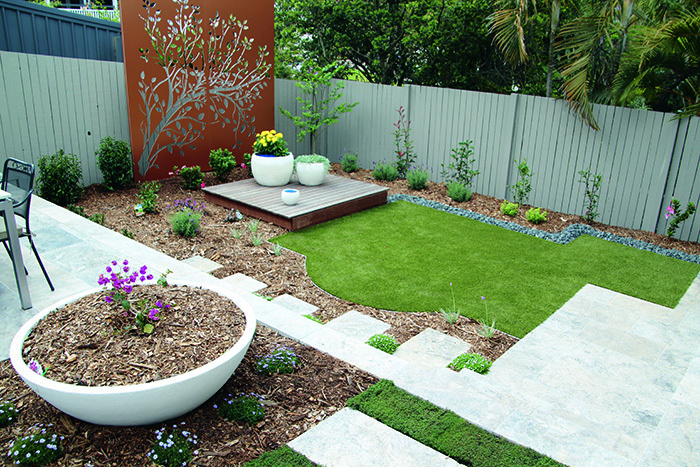 All of your outdoor projects can come to life with the Enigma Outdoors Group.